Sharing a studio flat in Dublin with two other people, Greek security guard Aris complains about the housing crisis that forces him to live in cramped conditions. "It's quite rough," said Aris, who splits the 850 euros ($970) a month rent for the 30-square-meter flat. With scant storage space, personal belongings are relegated to the ground. A kitchen hob is within arm's reach of one mattress, while the other two are pushed together. "It's not humane conditions to live in Dublin," said the 42-year-old, who moved to Ireland three years ago. 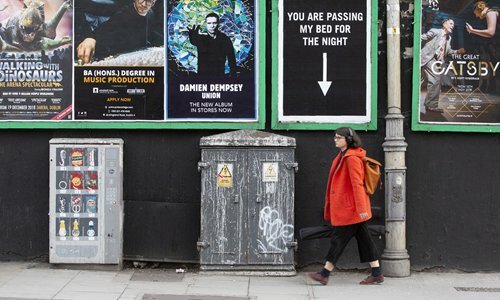 Rocketing prices have impoverished renters and pushed families into homelessness, leading to weekly protests in the streets of Dublin by affordable housing campaigners. Aris' situation is not rare in the capital, which is currently in the midst of a "perfect storm" that is driving the average rent to between 1,600 euros ($1,821) and 2,000 euros ($2,276). Increased immigration, depleted stocks of social housing, an aversion to building tall structures and simple greed following a hardscrabble recession are all factors. Dublin's increasing role as a tech hub is also bringing high-earners to the city, whilst Airbnb is capitalzsing on the popularity of the city as a weekend-break destination - to the detriment of people looking for long-term rentals. At one point this year, the property site Daft.ie said there were just 1,258 properties available for long-term rent in Dublin, while Airbnb offered 1,419 short-term lets. The irony is that Ireland witnesses an unprecedented property boom in the run-up to the 2008 financial crisis - a period known as the Celtic Tiger years. Construction of new properties ground to a halt after the crash, setting the scene for the current squeeze on housing stock as the Irish population grows rapidly due to a high birth rate and significant immigration rates. The results are clear in long-term rental advertisements: Rooms with vanishingly little floorspace are advertised for 1,000 euros ($1,138) and ranks of bunk beds in single rooms. "There's such a pent-up demand for housing across all the tenures, that people are desperate," said John-Mark McCafferty, head of housing charity Threshold. "There's a whole suite of different situations, whether it's people going into some level of poverty or people living in acutely overcrowded situations, and it's affecting people's quality of life." At the bottom of the property ladder, people are falling off the lowest rung - unable to keep up with rents that have risen 10 percent on average in the last year alone. The most recent housing ministry figures show 1,295 families were in need of state-funded emergency accommodation during a single week in October. In August, images of a young mother staying overnight with six of her children in a police station - bedded down on metal waiting room chairs for want of emergency accommodation - shocked the nation. One month later, balaclava-clad policemen and private security evicted protesters from a grandiose but empty house in central Dublin. Many saw the move as heavy-handed. Since then, major housing marches of thousands have been regular fixtures, led by activist group Take Back the City. "Housing is a human right!" and "Homes for need not for greed!" have been staple chants in demonstrations. Activists also occupied the offices of Airbnb - which has installed its European headquarters in the city. "Airbnb appears to have rapidly colonized vast amounts of our city, locking people out of homes," the campaign group said in a statement. In November, they stormed the offices of the Residential Tenancies Board, a government body responsible for resolving rent disputes. Prime Minister Leo Varadkar's government has tabled limits on letting with Airbnb, as well as stiff penalties of 30,000 euros ($34,000) for landlords who breach rent inflation restrictions. The government is also aiming to encourage the building of new homes. At a ribbon-cutting ceremony for a Dublin development in November, Varadkar was ambushed by a local resident complaining about the slow pace of construction of new housing. "It took 10 years to just build these two!" said 58-year-old Catherine Cooke. "How long is it going to take to build them over there?" she added - gesturing to nearby land. Varadkar quickly headed off for his next engagement in a sleek motorcade. As the cars left, Cooke muttered: "They're not doing enough."